A Location for Year Round Enjoyment. A Level of Fit and Finish for Year Round Luxury. A Symphony to Your Senses. 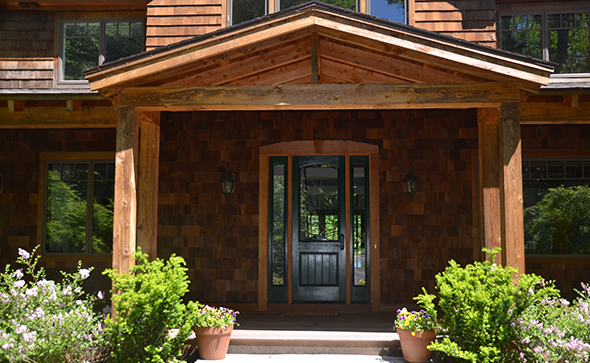 183 Wentworth Cove Laconia is a stunning lodge style home with a natural wood finish. With hardwood floors throughout 2 levels of the home and carpet on the lower level walk-out with a view, this property is designed for relaxed entertaining in rustic luxury. With a location within 15 minutes of downtown Meredith amenities, Church Landing, Gunstock Mountain Ski Resort, the Laconia Country Club and Golf Course, and Gilford Hills Tennis Club, 183 Wentworth Cove has a location that makes it ideal for year round or summer living. Near the end of a quiet road, but still part of a year round neighborhood, one can enjoy both quiet and the comfort of feeling part of an active community. Sited near the top of Wentworth Cove, this property captures views of the lake, Governors Island, mountains, and cross breezes on the sparkling water. 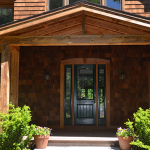 Throughout this new construction Winnipesaukee lake house is the work of master craftsmen, led by NH custom home builder, GaryCartier. As soon as you walk in the home, you see the high level of fit and finish and breathtaking design. Once inside the roadside entrance, you see, just beyond the foyer,the great room with french doors to the mahogany lakeside deck. A soaring, 2 story, real fieldstone fireplace flanked by built-ins, is the center piece of the great room. The rich cherry beams on the vaulted ceiling counterpoint the cream colored walls and bright blue of the lake views. The kitchen features large windows, top of the line applicances, and extensive counter space. With 3 sinks, including, a prep sink and a bar sink next to a Sub Zero beverage refrigerator, the kitchen is perfect. Spacious enough for entertaining large groups, yet sensitive to scale, the design accommodates a perfectionist's desire for elegant space and flow. With entrances to the great room, lakeside deck, dining room, and the sun porch, the kitchen is both airy and warm. A hallway leads to an office and a large master suite with its own entrance to the deck on one side of the entry level. On the opposite end of the entry level, the sun porch with its own fireplace, has an area designed to perfectly accomodate a grill for summer entertaining. Large windows create an indoor/outdoor feeling. Another hallway on the entry level leads past the laundry room and powder room to the attached garage. Cherry built-ins throughout the home, tile baths in all of the bedrooms, an interior sprinkler system in case of a fire emergency, and laundry rooms on all three floors, are examples of the attention to detail throughout this new construction home. The Adirondack flavor home has state-of-the-art radiant heat, and excellent energy star rating to help you save money on heating bills. The house has 5 finished en suite bedrooms, or use one of the three upstairs bedroom suites as a game room or library/media room. The lower level family room with a wet bar has ample room for a billiards table as well as another exquisite, real fieldstone fireplace. While all of the large bedroom suites have lake views and high ceilings, two airier suites are on the top floor, while two cozier ones are on the lower level.